The optimism that was evident following the last two weeks of strong wool market sales suffered a reality check this week. 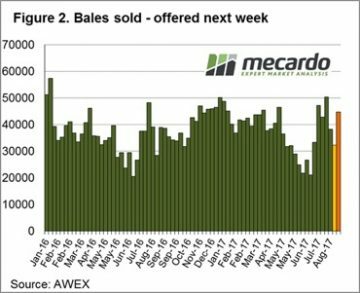 With the market only selling in Melbourne & Sydney, and with the sale conducted on Tuesday & Wednesday due to “Wool Week” activities, it was a sharp correction across all types that occurred. 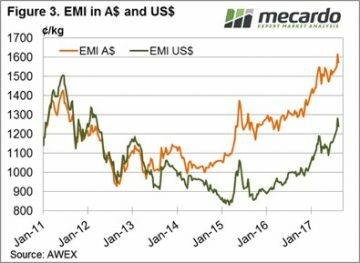 The EMI fell 42 cents in A$ terms to settle at 1,572 cents, while in US$ terms the market corrected 41 cents (figure 1). The finer types (19 MPG and finer) suffered falls in the order of 2%, held up by superfine wools (16.5 MPG) which valued at an 8 cents gain in the Northern market, the only plus for the weeks close. While the other Merino types were down 3% on last week. The response from growers was to pass-in14% of the offered wool, resulting in 32,342 bales sold for the week, well down on the average for this season. It is an interesting situation with the market trading at historic highs and yet we have a pass-in rate that is high by any measure. Growers are clearly comfortable holding out, despite these historically good prices, suggesting their not too concerned that any major correction will occur in the near future. While any correction is disappointing for sellers, it should be noted that the wool market is still well above levels of this time last year. Reports from Northern brokers on Wednesday proposed that the market may have found a short term base. Cardings have fallen in both Sydney and Melbourne, by 8 cents and 33 cents respectively. While Crossbred, after performing strongly in recent weeks, is now sitting 538.5 greasy c/kg, taking a slight retraction but still not as strongly hit as merinos. Next week Fremantle rejoins the selling roster and 44,750 bales are rostered (Figure 2). The pattern over recent months has been for the market to rally, then correct but quickly recover as growers hold wool back from sale. This is likely to be the pattern going forward so next week there is an air of optimism from sellers that we can see the market at least hold.